Things have been rather quiet on this blog in recent weeks, so apologies if you’ve been missing your regular fix of wince-inducing medical history. I’ve been busy working on a book which will be published in a few months’ time. 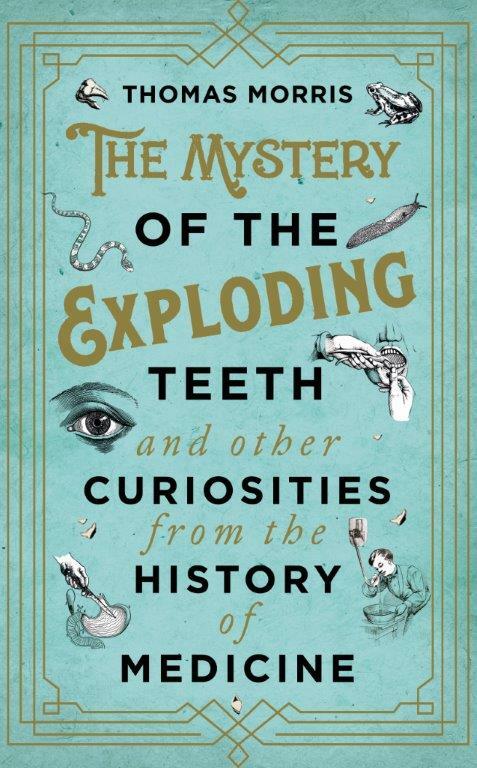 The Mystery of the Exploding Teeth (and other curiosities from the history of medicine) brings together around 70 of the most unusual and interesting stories I’ve discovered in the outer reaches of the early medical literature. One of the first people to look at the manuscript described it as ‘Horrible Histories for grown-ups’, which I like very much (whether or not it’s accurate). There’s more information on the website of my American publisher, Dutton here – where you can also pre-order the US edition, should you be so inclined. It will be published in the UK by Bantam Press, and is also available for pre-order from booksellers including Amazon, Waterstones, Blackwells and Wordery. Herr Schultze was summoned on May 25th to the house of a carpenter, whose wife, about to give birth for the fourth time, had reached her due date and had plunged into a state of somnolence so deep that it was impossible to rouse her from it, even if she was shaken violently or the vapours of ammonia, ether, etc., were wafted up her nostrils. On the third day of this unnatural slumber, the woman in question gave birth, without waking up, to a living male infant, healthy and perfectly formed. Well it beats gas and air, I suppose. When he visited the following morning, Herr Schultze found the patient had awoken a little earlier: she had done so of her own accord, and since she had no memory of giving birth, she was absolutely astonished to find that she had done so. A story so surprising that it was promptly reproduced in at least a dozen medical journals in France, Britain and America – and doubtless many others. But I wonder how many readers noticed that Herr Schultze’s article was copied from a book published half a century earlier? An identical story can be found on p.275 of Kleine Schriften praktischen Inhalts (‘Minor writings of a practical nature’) by Johann Peter Frank, an important figure in the history of public health and the prevention of disease. Frank’s version gives a different date (he claims to have visited the sleepy mother in 1769) and the husband is a soldier rather than a carpenter – but Schultze simply reproduced the rest of the story word for word. An unusually shameless bit of plagiarism. This book will be an excellent read for anyone currently in a hospital. It is on my list of things to gift purchase for any friends/family if they have to partake of the experience (but i pray not soon in my neighborhood), perfect!